The disease is characterized by various productions of autoantibodies or antibodies that attack the body itself. In lupus the autoantibodies against the cell nucleus and against the patient's own DNA are the most common. So you can already imagine the damage that can cause the disease, since it creates antibodies against structures essential to our lives. It is not known why the body starts producing these antibodies. There is probably a combination of genetic factors, because the disease is more common when there is a positive family history, and environmental factors not yet identified. Lupus attacks skin, kidneys, joints, lungs, heart, blood vessels, blood cells, nervous system, gastrointestinal tract and other organs and tissues. The disease is nine times more common in women than in men and occurs at all ages, being more prevalent between 20 and 40. Lupus is a difficult disease for treatment and in severe cases requires heavy use of immunosuppressive drugs. While it is a challenge to treat it, some results show how medicine has advanced in recent decades. In the 50s more than 60% of patients died before reaching five years of disease. Today 80% survive for at least twenty years. We will describe the most common symptoms of lupus. This does not mean that every patient with lupus must possess all manifestations explained below. There are cases of lupus with few symptoms and cases with many. The joint involvement occurs in up to 95% of patients with lupus. The two main manifestations are arthritis (joint inflammation) and arthralgia (joint pain without inflammation). These symptoms often appear years before the definitive diagnosis of lupus. They are migratory, i.e., the pains in the joints change point between 24-48 hours. One day knees can hurt, the other - fists, on a third day - the shoulder, then back to the knee, etc. The involvement is symmetrical, i.e. 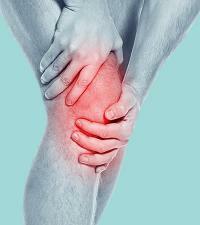 when one knee is in pain, the other one is also hurts. Usually polyarthritis or polyarthralgia are present, which means that several joints ache simultaneously. The involvement of one joint talks in favor of other diagnoses such as gout or septic arthritis. In general, the joint hurts much more than it may seem. The joints most commonly affected are the hands and fingers (phalanges), wrists and knees. Another very commonly affected organ is the skin. 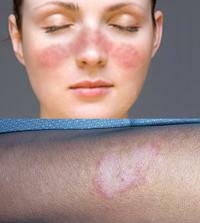 Up to 80% of lupus patients have some type of skin involvement, especially in sun-exposed areas. Typical lesions include malar rash or rash on butterfly wing. It is a reddish area that covers the cheeks and nose as seen in the photos. The malar rash appears on at least 50% of patients, usually lasts for a few days and there is always recourse exposure. Prolonged exposure to fluorescent lights can also trigger skin lesions of lupus. Another common skin lesion is discoid lupus, which is characterized by rounded and reddish plaques, most commonly on the face, neck and scalp. The discoid lupus may be part of the framework of systemic lupus, or be the only manifestation of the disease. In the latter case the prognosis is better, as there is no involvement of other organs. Patients with isolated discoid lupus have 10% chance of progression to systemic lupus erythematosus. 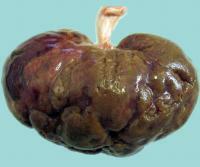 The more numerous are discoid lesions, the greater is the risk of progression to other organs. Other common skin lesions are hair loss, which can affect not only the scalp, but also eyebrows, eyelashes and beard. Oral ulcers similar to canker sores are common, however, usually being painless. Raynaud's phenomenon is a change in color of the limbs caused by spasm of blood vessels. The spasm of the arteries causes a sudden lack of blood leaving the pale hand. If the spasm persists, the lack of blood causes the hand that was pale getting purple. This ischemia can cause a lot of pain. When the spasm disappears, the rapid return of blood leaves the skin hot and red as well. Up to 75% of patients with lupus develop some kidney injury during the course of their disease. Classes III, IV and V are the most serious, with the diffuse proliferative glomerulonephritis (class IV) having the worst prognosis. The minimum mesangial glomerulonephritis (class I) is milder. With clinical data only it is impossible to establish which type of lupus nephritis is there, as proteinuria, hematuria and renal nephritis are a common finding in types II, III, IV and V. Therefore, all patients with lupus manifesting signs of kidney disease should be subjected to renal biopsy to identify which type of injury in the glomerulus causes autoantibodies. It is also possible that a patient has more than one class of lupus nephritis simultaneously. Classes I and II do not usually require specific treatment, however, classes III, IV and V have a worse prognosis and a high risk of terminal renal failure and are usually treated with immunosuppressive drugs. The most common are corticosteroids (cortisone), cyclophosphamide, cyclosporine, mycophenolate mofetil and azathioprine. Untreated patients or those not having good response to drugs inevitably end up needing hemodialysis. 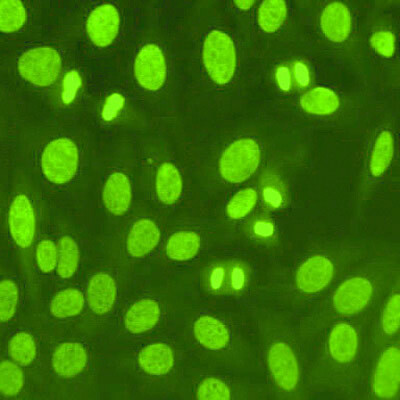 Another common hematologic change is a decrease in white blood cells (leukocytes), called leukopenia. The mechanism is the same as anemia, i.e. destruction and inhibition of its production. Following the same reasoning we can find the reduction in the number of platelets, called thrombocytopenia. When there is drop in the three bloodlines (erythrocytes, leukocytes and platelets) at the same time we call it pancytopenia. 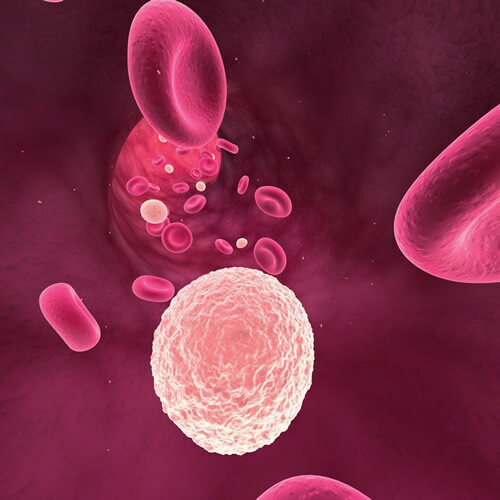 Any of these changes can be fatal, either by severe anemia, infections due to low white blood cell count or spontaneous bleeding due to a drop in platelets. Lymph node and spleen are also common in lupus and can be confused with lymphoma. 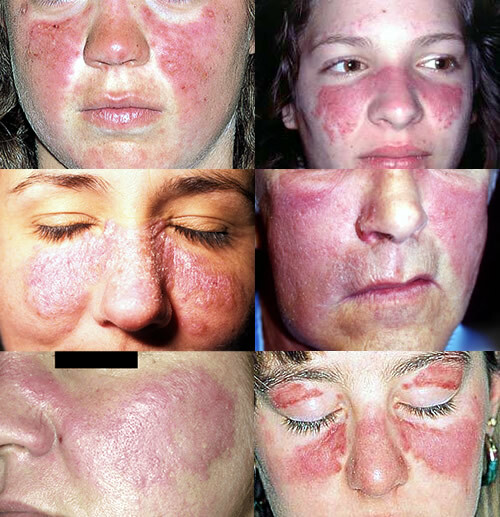 Another common problem in lupus is the appearance of thrombosis. The antiphospholipid antibody syndrome is a disease that occurs frequently in patients with lupus and is associated with the formation of multiple thrombi in both the arteries and veins, which can lead to conditions such as stroke, renal infarction, limb ischemia, venous thrombosis of the legs and pulmonary embolism. Apart from thrombosis occurring with the antiphospholipid antibody syndrome, the autoantibodies of lupus can attack the blood vessels directly, causing what is called vasculitis. Vasculitis can affect any vessel in the body and can injure skin, eyes, brain, kidneys etc. Lupus can present with neurological and psychiatric syndromes. The neurological injuries occur due to thrombosis and vasculitis, which eventually cause stroke. Psychiatric disorders can also occur due to lupus. The most common are psychosis, where the patient starts having bizarre thoughts and hallucinations, and dementia, with progressive loss of memory and ability to perform simple tasks. Virtually any organ can be affected by lupus antibodies. Pericardial effusion and pleural effusion (water in the pleura and pericardium) are common findings. Affections of the gastrointestinal system, lungs, heart attacks, heart valve lesions and pancreatitis may also occur. Other findings very prevalent in lupus are tiredness (fatigue), unintentional weight loss and constant low-grade fever. The diagnosis of lupus is made by clinical findings and determination of antibodies in the blood. The principal is the ANA (antinuclear antibodies), the antibody against proteins of the cell nucleus. ANA is almost always present in cases of systemic lupus, but can also occur in other autoimmune diseases such as hypothyroidism of Hashimoto, rheumatoid arthritis, scleroderma, etc. The ANA, however, may possibly be positive in normal people. Therefore, their presence does not necessarily confirm the disease, but their absence rule out the diagnosis of lupus almost 100%. The cases of isolated discoid lupus, without systemic involvement, are the exception and cannot have positive ANA antibody. The presence of two other antibodies is closely associated with systemic lupus: Anti-Sm and anti-DNA (ds). The presence of typical symptoms, positive ANA and one of these two antibodies closes the diagnosis of lupus. Lupus is usually treated with corticosteroids, chloroquine and anti-inflammatory drugs. More severe cases require heavier drugs such as cyclophosphamide, mycophenolate mofetil, azathioprine and corticosteroids in very high doses. 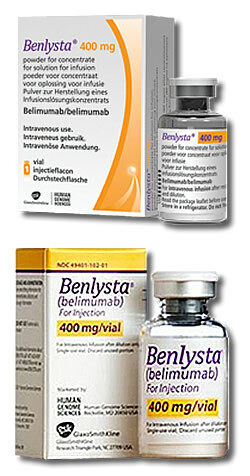 In 2011 a drug called Belimumab (Benysta) was approved for lupus. 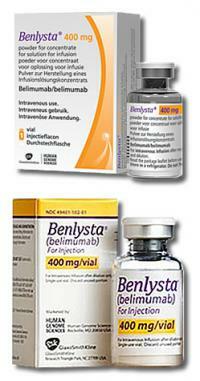 This drug is a synthetic antibody against B lymphocytes, the cells that produce defense autoantibodies of lupus. The Belimumab may be used in conjunction with existing drugs and appears to reduce the disease activity and the number of relapses. However, it is important to note that studies with this drug did not include patients who have used cyclophosphamide previously or have neurological or renal damage in lupus. This means that the drug has only been tested in patients with milder cases of the disease. Another result of the studies showed that the drug was much less effective in patients of African descent, not seeming to be a good option for this ethnic group. In very severe cases, such as vasculitis with diffuse pulmonary hemorrhage, neurological damage etc, you may need treatment with plasmapheresis to reduce the number of circulating autoantibodies.